Recently, my husband and I returned from a five day trip to Jamaica. Needless to say touring the country as an adult is a very different experience from visiting as a senior in college on spring break. For those of you who spent a spring break in Jamaica we encourage you to consider it for a second, third or fourth visit as there is quite a bit to behold. 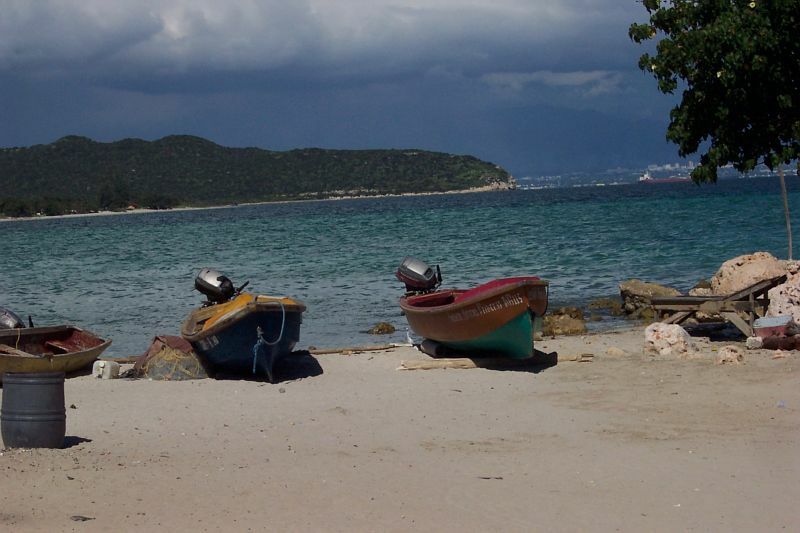 During our five day trip we bore witness to the beauty that is Jamaica. There are many attractions to be found in this Caribbean hot spot. The multiple flavors within this paradise are reflected in the wonderful hotels, amazing sites and markets, delicious cuisine and, most importantly, the people. Jamaica's proximity to the US, especially the East Coast, makes getting there very easy. Air Jamaica offers direct and non-stop flights to Kingston and Montego Bay from New York, Miami, Philadelphia and even other cities such as Los Angeles and Chicago. American Airlines also offers nonstop service to Montego Bay and Kingston. Even Air Canada offers direct and non-stop flights to Jamaica's cities of Montego Bay and Kingston from Toronto and more. The ease with which one can travel to Jamaica speaks to its accessibility for many travelers regardless of location. A simple plane ride is all it takes to arrive on this majestic island. Once on the island there is a wide selection of hotels from which you can choose regardless of whether you are a lone traveler, a couple or a family seeking activities for people of varying ages. We had the pleasure of enjoying the Iberostar Rose Hall Beach Resort, a five-star all inclusive resort in Montego Bay (http://www.iberostar.com), and Strawberry Hill (www.strawberryhillresort.com) in Kingston, a place we nicknamed 'heaven on the hill'. At both of these hotels the service was impeccable, beginning with the moment we arrived until we said our sad farewell. As an example, upon entering the Iberostar we were greeted by Kevin M., a bell hop, who helped us with our luggage and gave us a delicious Miami Vice as part of our welcome. He soon became our friend and when we left we hugged him good bye because we were going to miss his warm smile and fun conversation. We highly encourage you to book at least part of your stay in Jamaica at these hotels – at minimum one of them is a must during your visit if you cannot do both. As an all inclusive resort Iberostar offers activities for people of all ages. The beaches at this hotel are beautiful and you can even enjoy a workout class on the white sand. There are multiple restaurants of varying cuisines to enjoy: steakhouses, Mexican, Japanese, Cajun and Mediterranean. Some of the restaurants require advance reservations where others are a more casual buffet. For those travelers with children there is a kids club, allowing parents the freedom to enjoy other activities like scuba diving, the spa or shopping at some of the lovely stores during the day. The concierge is happy to make reservations for an excursion or restaurant of your choosing while you enjoy your stay. Currently, the Iberostar has two phases – the second a bit more upscale than the first. A third one is in the process of being built and it promises to be even more upscale then the second. When in Kingston, a stay at Strawberry Hill is not to be missed. 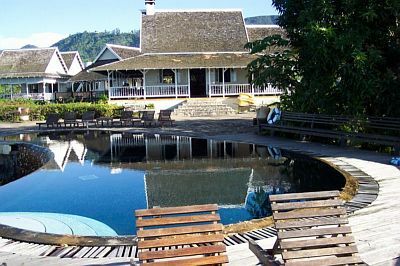 Located in the Blue Mountains of Jamaica, 3,100 feet above sea level, is a luxury destination, which rightfully earned our nickname of 'heaven on the hill'. As we ascended the windy road through the mountains we were greeted by beautiful views each surpassing the one before it. Our royal treatment began upon arrival; the staff was gracious and the aromatic warm towels a delight. There are only 13 cottages at this resort, two with two rooms; therefore, it is important to make reservations as soon as possible. The cottages are designed in such a way that you feel like you are in a private dwelling surrounded only by nature's beauty. While at Strawberry Hill guests must sample the spa, as we did, during their stay. We highly recommend the massages; there are varying types: elemental massage and fusion stone massage are just two of them. Guests can also take advantage of the facial and body treatments. As we sat and looked down at Kingston we couldn't help but feel a bit like royalty while staying at Strawberry Hill. Jamaica has more to offer than elegant welcoming hotels and spas it has a multitude of wonderful flavors, which called to us during our travels. Our palettes were awoken by the delightful tastes of the fruit at Croydon Estates, the jerked meats at Scotchies, the patties at Juici Patties, the fish at Hellshire Beach, the meal at famous chef, Jacqui Sinclair's home, and lastly the dining at Norma's on the Terrace. Further reinforcing these delectable experiences were the markets like the one we visited in Ocho Rios. There, we saw first hand the multiple fruits and spices so artfully used in Jamaican cuisine. We learned about callaloo, a leafy green vegetable, a key ingredient in typical Jamaican breakfasts and lunches. We also saw ackee in its raw form; it is a fruit that when cooked resembles the consistency and taste of eggs. In the Ocho Rios market we were shocked to see the size of some of the tubers – potatoes and yams that were as big as our melons in the United States made tasty additions to many of our meals. When in Montego Bay we visited Croydon Estates (http://www.croydonplantation.com), a trip that can be arranged through one's hotel. We saw fruits of all different colors, textures and sizes. The best part of our visit was the snack stops sprinkled throughout our tour. Who knew there were so many different types of pineapple: Sugar Love, Sam Clarke, Demerara, Bullhead, Cheese, Honey, Cowboy, Natal Queen, Ripley and Guyana? The aforementioned were just some of the 17 species on the plantation. Our personal favorite was the Cowboy, not too sweet and not too tart. Tony, the manager at Croydon Estates, and his staff see to it that all guests enjoy a wonderful learning and tasting experience. Our tour guide shared with us some of the natural remedies for an upset stomach and other ailments – Jamaicans use the leaves, seeds and fruit themselves for all sorts of homeopathic cures. Make sure to listen because if you aren't feeling well you may just discover a quick and easy cure. The 132 acres of Croydon Estates are home not only to fruits of varying kinds, but also to herbs, coffee and honey production. Our tour guide provided us with a great introduction into the coffee making business, a source of revenue for Jamaica. There are nine stages to coffee production: picking, pulping, washing, drying, hulling, selecting, roasting, grinding and brewing. We learned that a good reaper can produce two to three boxes a day – amazing! For those travelers who prefer, dare we say it, tea there was an explanation about the production of honey. This part of the tour is great for adults and kids alike because the staff work to make it interactive for guests' enjoyment. We learned of a mixture of garlic and honey – one teaspoon a day should cure the common cold. Since returning from Jamaica I have had honey on a daily basis. Luckily, there is coffee, honey and other tokens for sale at the end of the tour, which also includes some traditional Jamaican fare for lunch. On our way back from Croydon Estates to the Iberostar we stopped at a restaurant called Scotchies in Montego Bay, named after the scotch bonnet pepper. 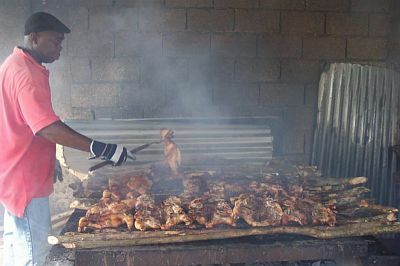 Upon arriving we were taken to the back and introduced to Shortie, the man responsible for preparing the jerked meats. We saw him prepare the fire and sticks upon which he laid the meats. The smoke that filled our lungs smelled of scallions, thyme, onion, garlic and scotch bonnet. We tried to get the secret recipe for the jerk sauce, but he could not be persuaded to share it. The owner Tony Rerrie manages Scotchies Too in Ocho Rios while his lovely daughter Kelly hosts those of us visiting Montego Bay. It was here we were introduced to another traditional Jamaican food – festival, a sweet rod shaped type of bread. Soon after tasting festival we became obsessed and had to order more; we even brought back a box of mix home with us so we can try to make it. Scotchies is an authentic Jamaican eatery across the street from the beach, a restaurant to be visited by all visitors of Montego Bay. Just as jerked meats are typical of Jamaican fare so are patties. During our third day in Jamaica while driving from Montego Bay to Kingston we stopped at one of Jamaica's famous fast food chains - Juici Patties. The most popular variety is a beef patty, but there is much more to choose from when ordering. We enjoyed the coco bread and a beef patty where some of our fellow travelers tried the chicken and cheese patties. There were other types of patties too such as soy, mega cheese and veggie; we also could have chosen from some of the loaves: meat, veggie, soy or coco bread. The place was filled with locals and we were able to enjoy a true Jamaican fast food experience. Even if you aren't apt to dine at fast food restaurants in the United States we highly recommend a quick stop at Juici Patties found throughout the country. Continuing our drive onward towards Kingston we later stopped at Hellshire Beach, a hidden treasure. There weren't many tourists at Hellshire Beach when we arrived for our tasty snack, but it is a worthy stop for those craving an authentic Jamaican experience. As if the food weren't enough of a reason to stop, the unadulterated beach that goes on and on where the white sands reflect the Caribbean sun and the crystal blue water looks like glass shining back at you will make you wish you could stay longer. The butterfish and parrot fish were recently caught and made to order. In a small kitchen in the back of the restaurant we watched as the chef worked his magic steaming and cooking the fish. Again, luckily enough we were able to have festival – a heavenly starch. Another traditional dish we had at Hellshire and other places as well was bammy, which is a type of patty made from a root vegetable like a potato that is grated, beaten and baked, sometimes fried. For starch lovers out there this is another enjoyable treat. After we settled into our high end safari-like accommodations at Strawberry Hill in Kingston we drove to downtown Kingston and had a wonderful time taking advantage of Kingston Restaurant Week. For those travelers who enjoy restaurant week in their own home town we suggest you check out www.go-jamaica.com/krw. You can plan your trip to Jamaica around this culinary fest; it usually runs in November, a perfect time to visit a warm vacation destination. We had the pleasure of meeting and dining with Stephanie Scott, the founder of Kingston Restaurant Week. After some encouragement from her son living in the US Stephanie decided to embark on starting what has turned out to be a successful dining week for Jamaicans and tourists alike. We were very impressed with Stephanie's professionalism and hard work in kicking off KRW, which started four years ago. After successfully getting the lead newspaper to be the title sponsor she was able to effectively solicit corporate sponsorship. This year she recruited 35 restaurants as participants in KRW. She even started a scholarship named after a recently deceased owner of a restaurant. The exciting conversation during dinner was matched only by the savory meal we had. We ate at the Market Place, which houses French/Italian (Café Aubergine), Middle Eastern (Habibi Latino), Chinese (China Express), Japanese (East Japanese) and Indian (Jewel of India) restaurants. By sitting in the open courtyard under the glowing stars we were able to select a restaurant of our choosing – we shared the dishes of Café Aubergine and Habibi Latino. The lamb from Café Aubergine basically melted in your mouth while the fatoush salad from Habibi Latino reminded us of previous trips taken to the Middle East. One of the best parts of the evenings was the hookah brought to us by the manager of Habibi Latino; we enjoyed the taste of orange flavored tobacco. The benefit of sitting in the courtyard is you aren't confined to one restaurant. However, if you end up making a reservation at a specific restaurant instead of the courtyard at Market Place you cannot go wrong. In Jamaica most good meals are followed with a cup of delicious Blue Mountain coffee. Although we learned about how coffee is made while at Croydon Estates we sought to see Blue Mountain coffee up close and personal in its home environment of the Blue Mountains. We visited the Usheima Coffee Estate not far from Strawberry Hill where Junior taught us all there is to know about Blue Mountain coffee. 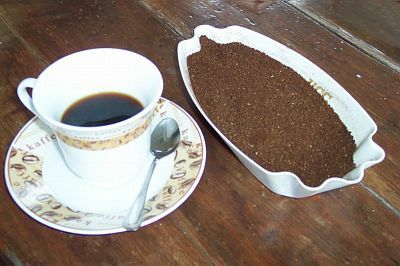 Blue Mountain coffee is known as the highest quality coffee and is a major export of Jamaica. There are two types of Blue Mountain coffee – Robusta and Arabica. The Robusta variety is closest to what was originally discovered n Ethiopia and can survive harsh environments. However, the Arabica is much more sensitive a plant; it prefers altitudes over 2,000 feet above sea level and doesn't like extremes or over exposure. There are ten core elements for judging coffee: sourness, sweetness, volatility (how much does it stimulate), aroma (brewed), fragrance (not brewed), bitterness, acidity, body, texture and caffeine level. In Jamaica the government regulates coffee roasting; it can reject the final product if it does not meet the Blue Mountain standard. Interestingly, we learned that a majority of this coffee is actually exported to Japan, about 85% of it. Therefore, while passing a super market we were all quick to buy a number of bags of Jamaican coffee to bring home as gifts – the taste of which is not to be equaled. Another experience that we will never be able to match was our lunch at Jacqui Sinclair's home. Ms. Sinclair is known in Jamaica as the Juicy Chef and she writes a column for one of Jamaica's two national newspapers, the Daily Observer. She was generous enough to open her family's home to us and our fellow journalists so that we could partake in an authentic home cooked Jamaican meal. Currently, she is working on a cookbook and we cannot wait for it to come out. When introducing her meal to us she spoke of the different cultures infused into her style of cooking, all of which are found in the Jamaican population: Indian, West Indian, Scottish and African as well as others. The Jamaicans have a saying, "out of many one people." Throughout our trip we saw the diversity that blesses Jamaica, but it wasn't until our meal at Jacqui's that we were able to see how seamlessly these different cultures could be integrated. Her cooking has benefited from her diverse travel and educational experiences; she spent time studying in Miami, Florida and London, England. This was one of the highlights of our trip; we were served delicious food cooked by our hostess and wines delivered to us by Debra Taylor, a brand manager for Lascelles Wines & Spirits. To say our taste buds were pampered as they never have been would be an understatement. Our first course included a roast pumpkin soup, which was infused with rum and rum cream. On a trip to Jamaica all travelers while purchasing Blue Mountain Jamaican coffee should not overlook the Appleton Rum selection. We recommend purchasing these items at a local super market in order to save money as even the duty free shops can be costly. There are a variety of Appleton Rums ranging from basic but still enjoyable Appleton Special Jamaican Rum to high-end Appleton Estate sipping rums. Rum creams are often used in cooking as Jacqui did because you can reduce them over heat and add them to dishes for flavor. 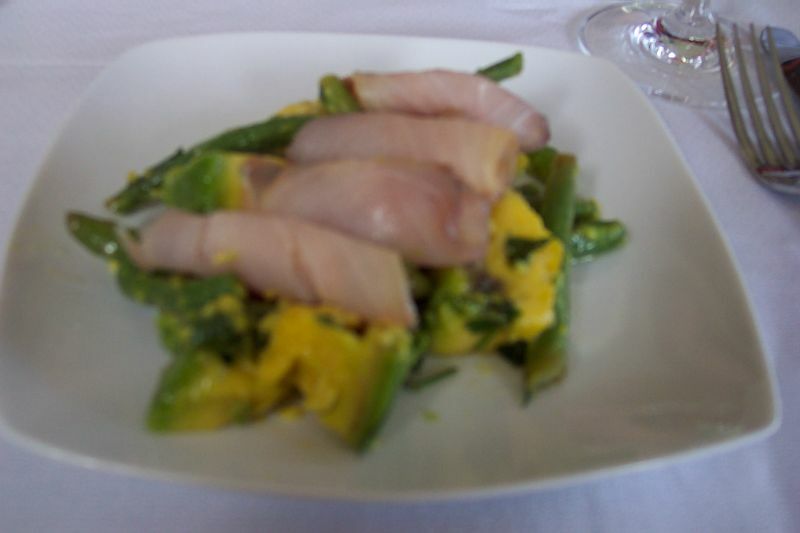 Next, we had our second course, a delicious combination of avocado, greens and smoked marlin. For our main course we savored the tastes of the curried coconut mahi mahi, callaloo, guava-glazed chicken and traditional Jamaican rice and peas. Dessert was amazing as was the entire meal; we had sweet potato pudding and white chocolate mouse served with sorrel compote and star fruit. Since Jacqui writes for the Daily Observer there were photographers at her home to capture our visit in support of her weekly column. Apparently, we were deemed good subjects because it turned out we were pictured on the cover of the Life Section in the November 20th issue of the The Daily Observer. Although our trip could have ended at this point given the vastness of the experience we were fortunate enough to have one more meal while in Kingston at Norma's on the Terrace. Norma Shirley the owner of Norma's on the Terrace works to "do fusion food." She creates dishes based upon the best ingredients across varying cultures. Although Norma started her culinary career in Stockbridge, Massachusetts it wasn't until she came to Kingston, Jamaica that she opened her flagship restaurant 11 years ago. While dining at Norma's try the feta salad with vegetables and fruit as a starter and the chicken with pineapple, cherries and delicious sauce for a main course. Like Jacqui, Norma worked as a food stylist before becoming a chef. Norma also worked on a kibbutz outside of Tel-Aviv for six months. Both Jacqui and Norma expressed the influence multiple cultures have on their culinary treats. They see diversity as a means of adding flavor to their recipes. Jamaica, as a country, reflects the colorful population it has not only in its cuisine, but also in its history and culture overall. As Jewish journalists we were very interested in the synagogue located in Kingston. During the Spanish colonization of Jamaica (1494 – 1655) many Portuguese Jews came to inhabit the island. The first known ship arriving with Portuguese-Spanish Jews came to Jamaica in 1530. Once the British took over Jamaica in 1655 Jews were finally permitted to worship in public. By 1660, King Charles granted Jews citizenship. However, by 1783 the plight of the Jews became quite tough; over the 18th century more and more restrictions were levied against the Jews. Despite this environment the Jewish population continued to grow. Synagogues were built in a few cities, one of which was Kingston. In 1882 a fire destroyed the Shaar Hashamayim Synagogue in Kingston, which is believed to have been completed around 1744. There was also an Ashkenzai synagogue in Kingston, but it too was destroyed in the fire of 1882. By 1921, the Ashkenazim and Sephardim were agreeable enough to join into one congregation – the Shaare Shalom congregation. This synagogue remains to this day with approximately 200 Jews living in Jamaica, most of who reside in Kingston. (www.jewishvirtuallibrary.org/jsource/vjw/jamaica.html.) The most fascinating fact about this synagogue is that unlike synagogues in the US this one has sand all over the floor. It has been said that the sand is symbolic of the sand that was used on the floor during services of Jews trying to hide their prayers during the Spanish colonization. Although Jamica like many other former colonies might have had a history of intolerance today it stands as a country that prides itself on its diversity. The influence of the varied cultures on the cuisine, lifestyle, music and country as a whole lend itself to a desirable vacation spot. During a trip to Jamaica there is no limit to what one can do whether it is an action packed filled adventure or a relaxing beach visit. We believe that striking a balance between the two allows travelers to enjoy the best of both worlds and all that Jamaica has to offer. This Caribbean paradise pleased us on multiple levels, including the exquisite meals, hospitable and lush hotels, exciting sites and markets and dynamic people. We were constantly learning and discovering new things about the country throughout our travels. After our visit to Jamaica we remain convinced that this is a country deserving of repeat visits. We are already looking forward to our next trip to the island where we can visit Croydon Estates, Jacqui Sinclair, Strawberry Hill and many other people and places for which our fondness cannot be forgotten.